OSA is a common and serious sleep disorder that causes you to stop breathing during sleep. Often, an anatomical obstruction closes the airway when we reach “deep” sleep and our muscles relax. As this occurs, the jaw and tongue will often collapse onto and block the airway, resulting in a lack of oxygen to the body and the brain. As a consequence, oxygen is deprived and arousal from “deep,” restorative sleep occurs. The result is a lack of quality sleep that our body needs to heal and recover. Diagram of airflow with Obstructive Sleep Apnea. The results of Obstructive Sleep Apnea, hypoxia (lack of oxygen), and the lack of restorative sleep is extremely harmful on the human body. Some side effects of Obstructive Sleep Apnea are excessive daytime sleepiness, difficulty focusing and concentrating, increased risk of life threatening accidents, high blood pressure, heart disease, increased risk of stroke, diabetes and depression. While screening our patients for risk factors of Sleep Apnea, we often look for contributing signs and symptoms. If you snore loudly, are excessively tired during the daytime, have been observed stopping breathing during sleep or have high blood pressure, you are at risk. Are you overweight, have a large neck circumference, have upper airway obstructions, are over the age of 40 or are male? You are at risk. Do you suspect that you may have Sleep Apnea? We encourage you to visit us for a screening or discuss this with your physician. 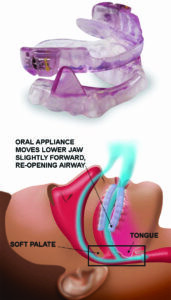 Modern Oral Appliance for treatment of Sleep Apnea. Treatment for OSA has traditionally consisted of CPAP (Continuous Positive Airway Pressure). Due to the bulk, constriction, noise and discomfort of CPAP, compliance is only 30-60%. We offer a better solution…Oral Appliance Therapy (OAT). Oral Appliance Therapy offers a solution to Sleep Apnea with a device that fits in the palm of your hand. The most common appliance is a Mandibular Advancement Device (MAD). It is a device that holds the lower jaw forward during sleep. As a result, an open airway is maintained, allowing a refreshing night’s sleep without CPAP. When Should I Contact my Dentist About Oral Appliance Therapy for Sleep Apnea? Obstructive Sleep Apnea is a medical condition and can only be formally diagnosed by a sleep physician based on the results of a sleep study. If you suspect that you may suffer from OSA, Advanced Dental Concepts offers free “screenings”. Screenings determine risk factors and symptoms related to OSA, but do not offer a diagnosis. A sleep study, either at home or in a sleep lab, and a diagnosis by a licensed physician are necessary and may be suggested based upon the screening results. If a patient has been formally diagnosed with OSA, they are categorized as mild, moderate or severe based upon the results of a sleep study. For mild to moderate cases, oral appliance therapy can be a first option for treatment. 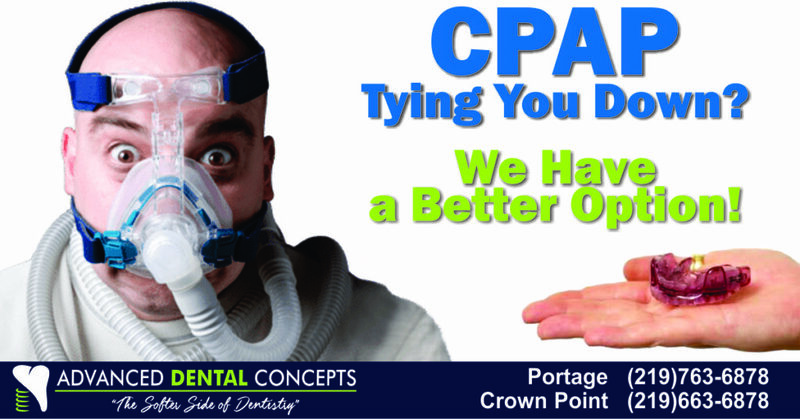 If you prefer oral appliance therapy over CPAP, you should contact your sleep dentist. Oral appliance therapy can only be performed by a sleep dentist. For medical insurance purposes, a prescription for oral appliance therapy should be obtained from your physician. For patients that have been diagnosed with OSA, been prescribed CPAP and are non-compliant, oral appliance therapy may be the treatment of choice. Remember, CPAP compliance ranges from 30-60%. Consequently, 40-70% of patients with CPAP are not treating their serious medical condition. If CPAP is not working for you, you should contact your sleep dentist to see if oral appliance therapy is right for you. When should you contact your sleep dentist about oral appliance therapy for obstructive sleep apnea? According to your Crown Point sleep dentist, Dr. Danny Hayes, you should request a FREE screening immediately if you suspect OSA is affecting you. If you have been diagnosed with mild to moderate OSA, and prefer oral appliance therapy over CPAP, you should contact your sleep dentist immediately. Finally, if you have CPAP and can not tolerate it or are non-compliant, you should contact your sleep dentist immediately. Dr. Danny Hayes is a member of the American Academy of Dental Sleep Medicine. He is specially qualified in providing dental solutions for OSA. For more information on Sleep Apnea or treatment, we welcome you to contact Advanced Dental Concepts to schedule your appointment.